podmoskovnik, who estimated 16% fraud for the Duma elections (also the one whom the WSJ plagiarized off). He got this figure by assuming that in a fair election, the share of the vote for each candidate at each level of turnout had to be a constant factor. This is, of course, a flawed assumption, as I argued extensively in Measuring Churov’s Beard. First, that would imply that elections in countries such as Israel, Germany, and the UK – where the share of the vote for right-wing parties rises with turnout – are also falsified. 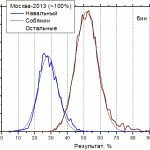 Second, it is further refuted by Russian opinion polling evidence: Rural Russians are both more more likely to vote than urban ones, and more of them would vote for Putin. 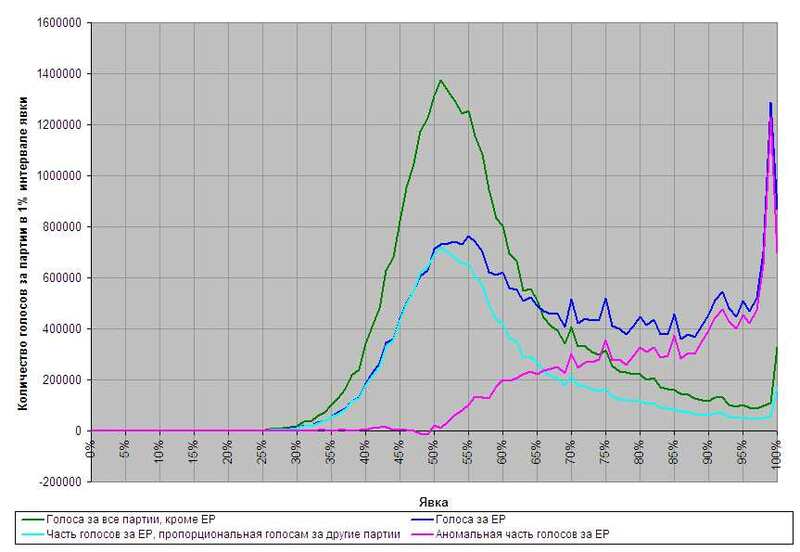 This influence of electoral sub-groups partially explains United Russia’s “fat tail” to the right of a turnout / share of the vote graph (although NOT the spikes at 80%, 85%, 90%, and 100%, or the general “bump” in that region). As such, we can say with confidence that the level of falsifications was significantly lower than 16%, i.e. around the 6% or 7% indicated by FOM’s exit poll. The bottom axis is turnout in the 2011 Duma election, and the vertical axis is percentage of the vote. The green line is the vote for non-UR parties, the blue line is the vote for UR, the cyan line is the vote for UR if it remained strictly proportional to the votes for the other parties on the right hand side of the graph as well as the left, and the purple line denotes the anomalous part of the votes for UR. The latter are 16% of all the votes, and are taken by Shpilkin to be synonymous with falsifications. 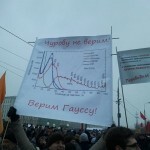 This graph shows the exact same for the 2012 Presidential elections, just replace UR above with Putin. The anomolous part of the graph is visibly much less, at 6% of the total votes. 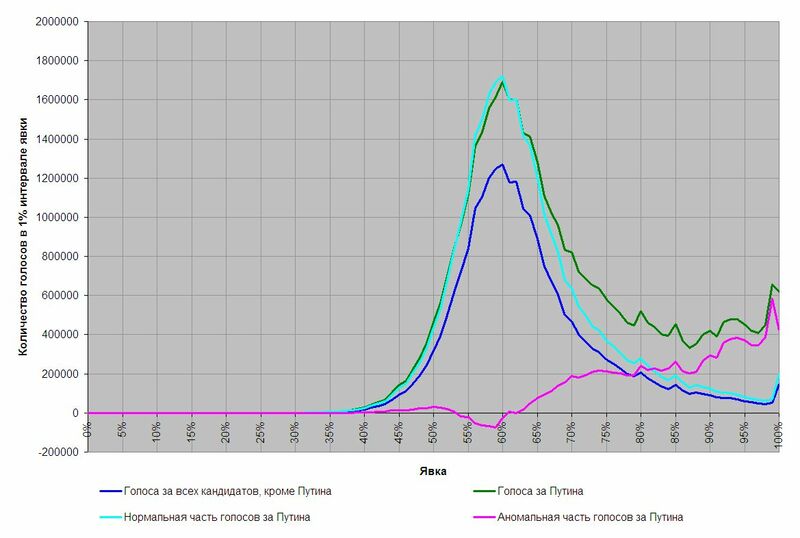 Of course, as acknowledged by Shpilkin himself in discussions with another mathematician Dmitry Kobak (if not in the media), this method is flawed, and a more accurate approach would be to break down this analysis by region, with separate graphs for cities and villages. This approach, which is far more accurate, yields 59% for Putin, i.e. about 4% something falsifications. (I.e., almost exactly matching the results of the FOM exit poll, at 59.3%, and the VCIOM exit poll, at 58.3%). One caveat is that the separation between “cities” and “rural” may still be too crude, even at regional levels; there are still significant differences between voting patterns in bigger towns and smaller towns, for instance, with the latter closer to the profile of villages (i.e. higher turnout, and more votes for Putin. This may trim down the fraud by half of to one percentage point. 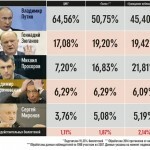 (1) The Presidential election, though still very sub-par, was not just modestly but A LOT cleaner than the Duma ones. The absolute lowest feasible “floor” on Putin’s real result is around 57% (note: confirmed by properly adjusted figures from observers). This is well above the critical 50% mark that the radical opposition and Western journalists claim that Putin actually got. (2) I was predicting that Putin would get about a real result of 56%-57%, as in the forecasts of the major polling agencies, and about 2%-3% of fraud would raise it to 58%-60% (hence, I predicted 59%). In reality, his real result was probably 59%-60%, with still higher than what I expected fraud of 4% raising it to 63.6%. (3) As the adjusted Shpilkin/Kobak statistical method appears to be reliable, the real level of fraud in the Duma elections may well have been closer to 10% than to 5%, which would begin raising real questions about its legitimacy.